Today we are interviewing Terry Robinson about his fascinating autobiography titled "A Walk With An Irishman." I was born in Dublin, Ireland in 1927, one of 5 children and because of my father becoming an alcoholic was forced to adapt to a lifestyle that eventually helped me to become the person I am today. Happy beyond my wildest dreams.I worked as a motor mechanic for most of my life. I love to meet people and hear their stories. I am an author,poet and singer. I have also just written and recorded my first song Bed of Wishes. The purpose of my book is to leave a little something behind me and also to encourage others to write their story. 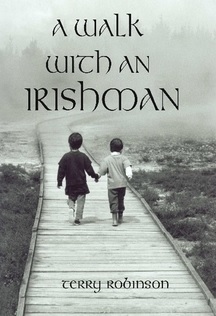 I believe so many great stories go untold and A Walk With An Irishman is my way of demonstrating what can be achieved. I really enjoyed writing and collaborating with others to make this book a reality. People who feel a need to really be themselves at any God given moment. Those that love adventure and a good laugh. What inspired you to write your autobiography? When I went to visit the South Island in New Zealand after I separated from my wife I was told by a friend I met that I should write a story about my life. Once the seed of that thought was planted then I had to bring my story to life. You cover a lot of ground in your book, from childhood in Dublin to joining the Royal Air Force to moving to New Zealand. How did you decide which periods to focus on with your writing? I wanted to build a complete picture for the reader of the experiences that shaped me. As a child growing up in 1930’s Dublin I spent a lot of my youth cycling and was a member of the boy scouts. Leaving home at 17 to join the Royal Air Force and go to the Middle East was a significant step for me. My travels did not end there though and after 14 years of marriage I took a gamble on new life in New Zealand with my family where I now live happily today. While writing and remembering your life, did you learn anything new that you hadn’t considered before? Yes, I learned a lot more about myself when writing my story, I learned to be more tolerant,caring and understanding of others. I learned that there is nothing like achieving my dreams. You’re also an active blogger. Tell us a bit about your blog. It was my good friend Patrick O’Reilly who suggested I write a blog. I really enjoy writing and connecting with people.. I have a collection of my writings and songs I like to sing listed on www.spiritualirishterry.com. In addition to blogging, you’re a musician. When did you first get interested in music? Where can people find out more about your music? People will find humour, an interesting story and hopefully inspiration to tell their own story. Do you have another writing project planned? No, I have not planned another book. My blog will be the continuing story of my life, and of those who help me fill it. Just that it was written from the heart, and to try and read between the lines. I also welcome your feedback on my blog.